There we were, heading west on Sunrise, trying to make a right on Federal, in a turn lane backed up to eternity with Friday after-work traffic. We were just feet from our destination, but so far away. Suddenly, there was a break in traffic – and the gas pedal somehow ended up on the floor. Under it, the Jaguar F-Pace broke out into a sprint. The turn lane straightened quickly, and so that meant turning the wheel at a full-out race to 40 mph. In many SUVs, maybe that would have meant all body roll and back-end craziness. But the F-Pace is a sports car, really. It’s sure-footed from all-wheel drive and as quick and maneuverable as most two-seaters. It’s a car as fun as a Saturday afternoon, with enough room to haul an entire weekend of everything. 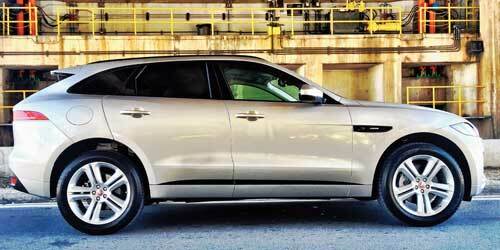 Jaguar built its first SUV this year to compete with all the speedsters now in the category. It clearly checks every single box against the competition: Its off-road capability comes from sister brand Land Rover, and it still drives as good or better as anything with ground clearance. Even Car and Driver, that BMW-obsessed car magazine, lists it as No. 1 among 16 luxury crossovers. Yes, it’s quite possibly more fun than any crossover Porsche or Audi or anything any other luxury brand you’ve seen on the road for years. Then there’s the design. Inside, it’s nearly all elegant English reserve, black stitched leather and a wide touch screen in the center of a dash with just the right number of buttons and dials. At night, the only bling comes to life: art deco-like green lights the swoop along the doors. The front is pure snarling sports car, with a broad toothy-grin grill, sneering eyes for headlights, and creases in the hood that scream that something fun is underneath. Open the panoramic sunroof and it juts upward, and with the hefty spoiler off the back window, the F-Pace looks like it’s sporting a cape. Then there’s the burly back end, cribbed from the handsome two-seat Jaguar F-Type. The top-notch tech includes a handy lane departure system that vibrates like a highway rumble strip when you start to drift. There’s also something novel in a button that tops out your speed; set it to, say, 70, and even a floored gas pedal won’t allow you to go faster. And then, for the sporty among us, there’s an optional waterproof “activity key” that you can wear like a bracelet. Our rush in the R-Sport edition of the F-Pace that Friday was – honestly – fairly pedestrian. A birthday party was starting in minutes, and we had to pick up a cake from Sweeter Days Bake Shop. After our sprint to a velocity modestly over the speed limit, the F-Pace sliced its way through afternoon rush-hour traffic and into the left turn lane. The U-turn came easy, the F-Pace angling into the middle lane, a turning radius of a far smaller car. Again came the gas pedal, and the F-Pace exhaust roared like a creature from Jurassic Park. It’s a moment like this when you really appreciate seat bolsters, hefty ones in the F-Pace. They seem to grab onto you, keeping the driver right in place for a quick reversal toward the bakery. It becomes clear why the seats are as stiff as a church pew when you’re throwing the Jag around in turns. The bakery came up quick, and the F-Pace’s gigantic brakes went to work before the entrance to the parking lot, from 40 to zero in immediately. Inside, the carrot cake for Nate had just gotten a coating of cream cheese. The boys in the bakery packaged it up and advised we keep it cool. No problem in the F-Pace. Its AC seats blow like a feeder band, as cold as a mini fridge. And the smooth ride kept that three-tiered cake from toppling onto the floor. Heading back into afternoon traffic, it became clear the F-Pace would much prefer to go fast. Even without dropping the handsome round gear selector into “sport,” the Jag always seemed ready to jump, any serious weight on the gas pedal meant leaving traffic far behind. Which is what we did when we ended up first at the light in front of Fresh Market. We had a bit of blacktop with nobody in front of us, a miracle of South Florida traffic. And the F-Pace ate it up like cake. Not like a rumbling SUV, but something far more fun.